By the time this photograph was taken in 1900, the exterior had been heavily altered. The 13th Street side had been raised to match the Broadway elevation, matching window openings covered the side, the tall oriel window was gone and the parapet remodeled -- photo NYPL Collection. John Johnstone Wallack was born in New York City on New Year’s Day 1820. But the newborn did not stay in the city for long. His British acting parents were in New York on their first tour and the baby boy was soon taken back home. He was educated in England and at the age of 20 was commissioned a lieutenant in the British Army. But Wallack preferred the stage to the barracks and left the army for a life in the theater. Wallack’s passion for acting came naturally—his father James William Wallack was an actor. Using the name Allan Field, he toured with his father. When he appeared in Dublin as Don Pedro in “Much Ado About Nothing” in 1842 he changed his stage name to John Wallack Lester. He was back in New York in 1847 where he debuted at the New Broadway Theatre. 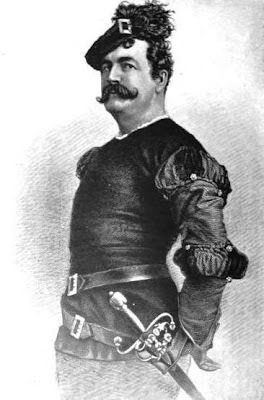 While he appeared in Shakespearean roles in various Manhattan theatres, his father opened the hulking Wallack’s Theatre at the northeast corner of Broadway and 13th Street on September 25, 1861. Designed in the German Romanesque “Rundbogenstil” style, its many arched openings could not relieve the heaviness of its red brick mass. Yet the building had delightful decorative touches. At the corner a story-tall oriel window terminated in a balcony within a concave niche. Ornate sculptural ornaments filled the spandrels between the colossal second story windows. On the 13th Street side, the fourth and fifth floors slanted back as a high mansard roof, partly broken by a giant arched stained window that interrupted the flat cornice. The Wallack was 75 feet wide and stretched 148 feet back along 13th Street. The spacious stage measured 48 by 45 feet and the auditorium, decorated in red and gold, could seat 1,600. The new theater opened with Tom Taylor’s comedy, “The New President,” and before the curtains opened, James W. Wallack, Sr. strood on stage and made an address to the audience. It would be his last appearance on any stage. 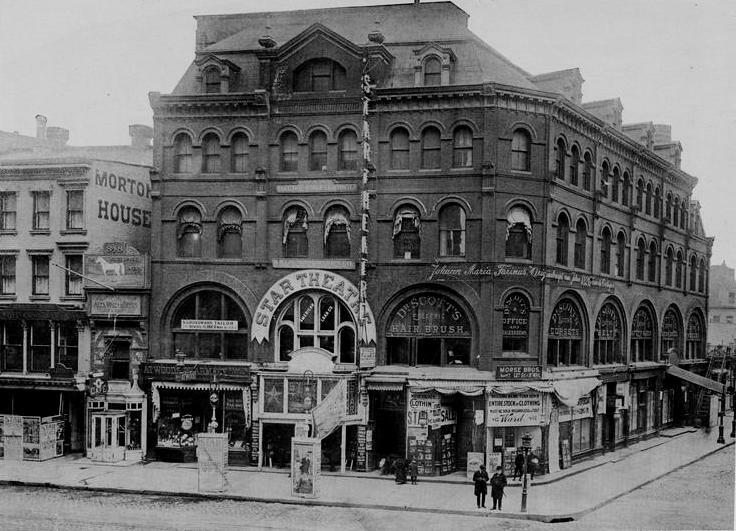 James W. Wallack, Sr. lived only three years after opening his theatre, and upon his death in 1864 John Lester Wallack took over as sole proprietor and manager--as well as leading actor. John Lester lured the greatest names in American theatre to the stage of Wallack’s Theatre: John Gilbert, Frederic Robinson, Owen Marlowe, H. J. Montague, Rose Eytinge, Helen Tracy, Maud Granger and Maurice Barrymore among them. The play ran for 118 evening performances; nearly a year and a half—until the following March--with the playwright himself taking the leading role. The receipts for the 1875 Thanksgiving Day matinee totaled $2,250; the highest ever recorded for a single performance in New York City. 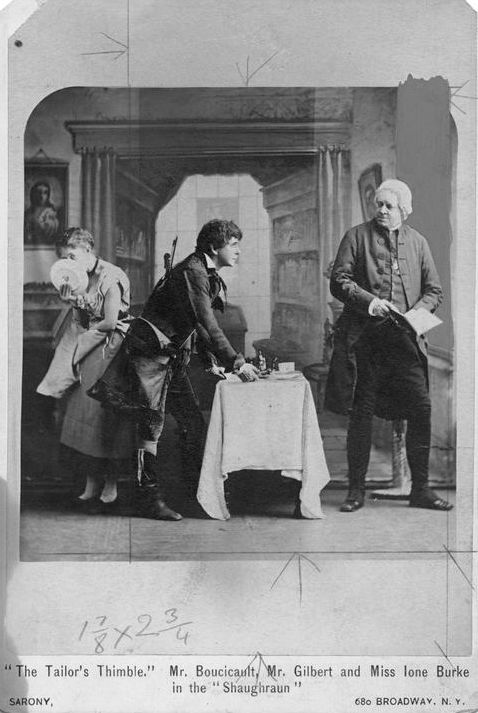 The play amassed a fortune of half a million dollars for Boucicault, which he reportedly quickly squandered away. 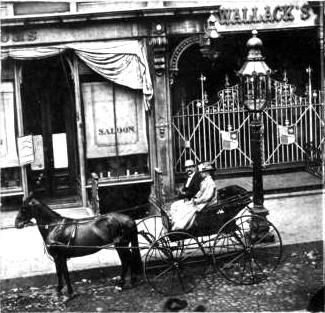 A light carriage pauses before the gates to Wallack's Theatre around 1875 -- photo NYPL Collection. Within a few years, however, the aging John Lester built a new Wallack’s Theatre further uptown. By 1881 most of the Lower East Side neighborhood had become “Little Germany” as German immigrants filled the neighborhood with music halls and biergartens. Adolf Neuendorff ran the Germania Theatre and its success resulted in his need for a larger space. In May 1881 he took over Wallack’s, signing an 8-year lease for $40,000. 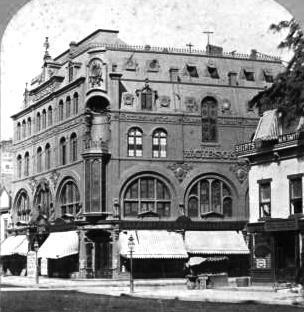 Neuendorff remodeled the interiors that summer and, to great acclaim, opened the new Germania on September 15, 1881. But Neuendorff had overestimated the popularity of his theater group. The venue was too large and, faced with serious competition from other German theatrical groups, the Germania failed. Before completing his second season in the old Wallack’s Theatre, Neuendorff closed the doors on March 24, 1883. New proscenium boxes were installed, upholstered in green, blue and gold with scarlet satin damask draperies and gray-green plush. The balcony was raised two and a half feet to reduce viewing obstruction and the chairs throughout were reupholstered in scarlet velvet. “Thus improved the Star starts out for the season one of the most attractive and cozy theatres in the city,” remarked the newspaper. The auditorium could now seat 1,750 persons. Movie goers sat in the dark and, as the film commenced, saw a normal Manhattan street scene. There was the Star Theatre as men in derby hats and women in shirtwaists busily crossed the street and dismounted from trolleys. Suddenly the speed increased and the street cars and passersby whisked by at lightning speed. Window sashes disappeared, then nighttime engulfed the structure for moments, before sunlight quickly reappeared. Demolition workers sped along the roof like insects as the height of the building decreased before the audience’s eyes. On nearby buildings the canvas awnings rolled out, then in, in a dizzying manner. Little by little the Star Theatre crumbled away until it was no more. And then, to the surprise of the audience, it began arising from the rubble. The inventive movie producers reversed the action and the movie-goers were amazed to see the entire structure rise again. But the film was more than a gimmick. The American Mutoscope Company meant for the film to symbolize New York City’s continuous building, razing and rebuilding. 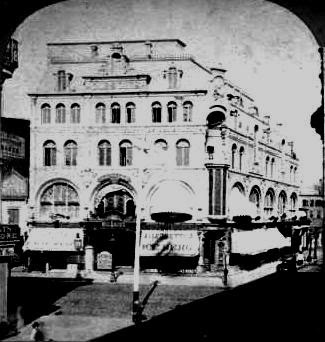 Wallack’s Theatre, at one time the most famous and illustrious theater in New York and possibly the country, was no more. Few people today know that it stood on the corner of Broadway and 13th Street and the names of the legendary thespians who trod its boards are largely forgotten.